What’s a road trip without snacks? To completely enjoy your ride you need to make sure you’ve stocked up on everything you’ll need: music, games and snacks. However, life on the road can get expensive and a bit unhealthy. There are different ways to combat both. An easy fix for both is to make your own healthy, homemade road trip snacks. What better way to eat exactly what you want, save some money and stay healthy? Easy to make and so much tastier than store bought bars. Preheat oven to 325 F. Spray a 9×13 pan with cooking spray and line with parchment paper. Combine oats, flour, coconut, brown sugar, salt and dried blueberries in a large bow. Stir well. In a separate bowl, whisk together coconut oil, honey, coconut extract and vanilla extract. Pour the wet ingredients over the oat mixture and stir to combine. Press the granola mixture into the prepared pan. Bake for 40 minutes or until the granola is golden brown. Allow to cool completely and then cut into bars. Tip: if individually wrapped, the bars will remain fresh for several weeks. Perfect for a healthy road trip snack! These will fill you up on your journey with fiber instead of fat. Put oats into a small bowl with buttermilk. Let sit for two hours at room temperature. Preheat oven to 375 F. Grease 12 muffin cups or line with paper muffin liners. Stir together whole wheat flour, baking powder, baking soda and brown sugar. Stir in oat/buttermilk mixture, applesauce and egg; mix well. Pour batter into prepared muffin cups. Bake in preheated oven for 30 minutes until a toothpick inserted into the middle of the muffin comes out clean. Tip: Wrap in aluminum foil to keep the muffins moist and fresh while you’re on the road. 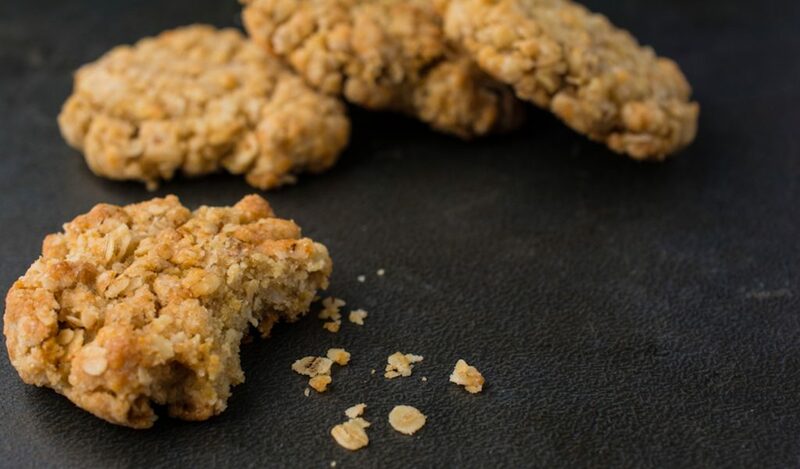 Save some money on your road trip by bringing along these healthy, filling breakfast cookies instead of stopping for breakfast every morning. In a large bowl, whisk together almond flour, baking soda, salt and cinnamon. Stir in oats, coconut and walnuts until evenly distributed. Add dates, bananas, vinegar and coconut oil to a food processor and process until smooth. Add eggs and process until combined. Pour date mixture over almond flour mixture and stir until combined and no pockets of dry ingredients remain. Scoop batter out in 1/4 cupfuls and place on baking sheet about two inches apart. Flatten batter balls to 1/2 inch thick. Bake for 15 to 18 minutes or until cookie tops are set. Let cool. Tip: Make in advance and freeze so they’ll be fresh on your trip. These snacks are perfect for your trip as they are not only super tasty, but will fill you up; each ball is worth 5 g of protein. Mix together protein powder and almond meal in a medium-sized bowl. Mix in nut butter and maple syrup with the dry ingredients (the batter should look like cookie dough at this point). Add in chocolate chips with a final mix. Scoop up the dough and roll into balls. Tip: These balls are so quick to make, change up the ingredients (add some dried fruit or nuts) and bring lots with you. Make these healthy kale chips to snack on instead of potato chips. When made correctly, they’re tastier and definitely healthier than regular chips. Preheat oven to 350 F. Line a non insulated cookie sheet with parchment paper. Carefully remove the kale leaves from the thick steams with a knife and tear into small pieces. Wash and thoroughly dry kale. Bake for 10 to 15 minutes or until the edges are brown. Tip: seal the finished kale chips into a container so they stay fresh and don’t get crushed on the road.